We will be doing a website re-vamp over the next week or two ((hopefully!!)) I am planning to go with a more stationary theme (as opposed to seasonal) with the possible exception of Christmastime! So be sure to keep an eye out if you want to see my new look! Or subscribe to my blog feed (if you haven't already) because I am sure a blog regarding our accomplished task will be posted!! You may also notice some slight changes already on my side bars. 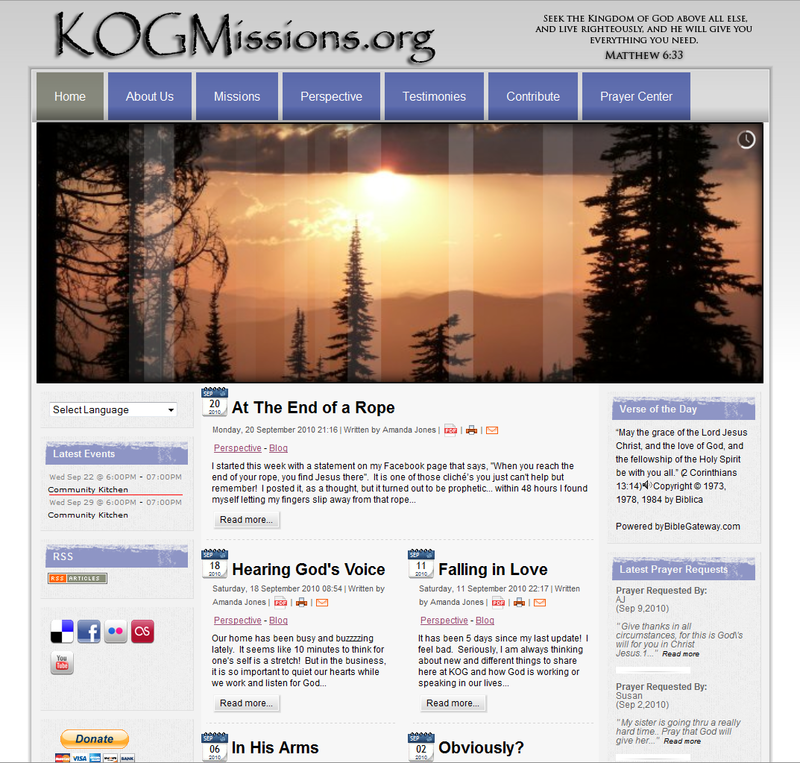 My handy-dandy-techno husband made a nice 'button' for our primary missions website, KOGMissions.org (Stands for Kingdom of God Missions because God has called us to share how He wants His kingdom to be experienced here on earth!) When I am not writing here at The Faithful Homeschool, I am usually popping up thought provoking tid-bits at KOG. Also of interest is a review I am working on for Blog Sneeze. I am reading the book, "Finding Our Way Again: the return of the ancient practices". It is a meaty read that already seems to have implications for our ministry. I really need to set aside more time for this task (it certainly requires more focus than my usual lazy-day-reads by Janette Oke and the rest)! Lastly, I want to thank so many moms for their blogs out there in cyber space. Your sharing and encouragement reflect the diversity and insight needed to sustain the path of every homeschooling parent who takes the precious time to read! There are so many styles to homeschooling and I am the type of person who likes to make sure she is doing things right.... although shortcuts within the 'rules' are always handy! ... or a Bruck! Used in our region by the Great Northern Railroad in earlier 1900s! All three progressed in subjects we have previously been stagnant in, Bible studies for BSF were completed in full... 2 days early (with awesome discussion in the process), and writing skills were rehearsed without tears!!!! I am so excited and I pray we have many more weeks like this one in our adventures in homeschooling! I pray you have a lovely weekend and blessed experiences in this wonderful, virtual, homeschool community so time with your kids is more joyful as well!